Welcome to the Freedom Hill Chapter, National Society Daughters of the American Revolution (NSDAR or DAR). We are a vibrant, growing chapter spanning all ages and backgrounds. Based in McLean, Virginia, we have over 200 members from as close in as McLean and Great Falls to as far away as Fredericksburg! We have been recognized frequently as one of the top chapters in Virginia for supporting and encouraging our members aged 35 and under. Our membership covers the entire age spectrum, and all ages are well represented. 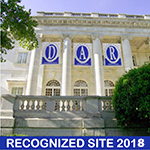 Many of our chapter members have served or currently serve DAR at the district, state, or national level. Many of us work outside the home in positions in private industry, government, and education. Others work at home, both with and without pay, and engage in a variety of volunteer activities. What we share in common, in addition to our patriot lineage, is our love of family, community, service, history, patriotism, and country. We look forward to meeting you and hope that you will join us — there's something for everyone in today's DAR! Find out about our organization, mission, activities, and the results of our decades of service.